A key stage in adventitious rooting is the de novo formation of a root meristem. This involves the dedifferentiation of induced cells followed by cell division and enlargement to form a meristem. Subsequent primordium development leads to root emergence and growth. Cells are said to be competent for root formation when they are able to respond directly to an inducing stimulus (usually wounding and/or auxin) by the direct formation of root primordia [Geneve (1991); see also the chapter by Mohnen in this volume]. Cells which are not competent are unable to respond directly to the stimulus, but may attain the competent state indirectly via non-directed cell division. It is clear that such a major shift in the developmental fate of cells involves complex interacting changes at the biochemical level and at the level of gene expression. 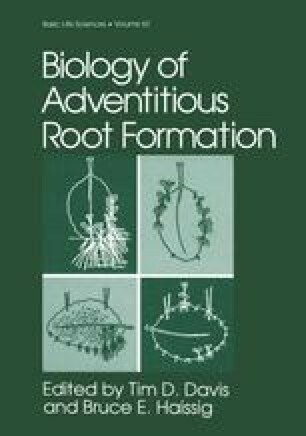 There is substantial evidence that auxins play a crucial role in the formation of adventitious roots, but they are not the sole determinant (see the chapter by Blakesley in this volume). Many other compounds are involved in the rooting process, as reviewed by Haissig and Davis in this volume.